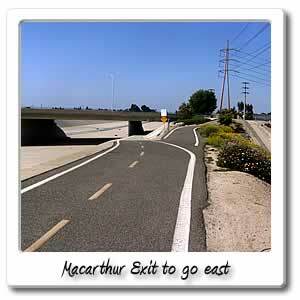 Welcome to MacArthur on the Santa Ana River bicycle trail. 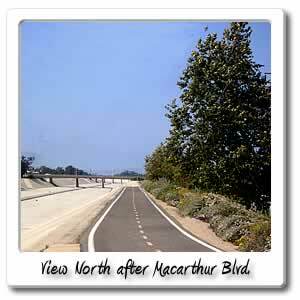 Just after mile marker 5, will lead you to the MacArthur bridge. If you go west, you'll be in Fountain Valley and less than 1/2 mile away, you'll find a ice cream store, Big Lots, Taco Bell, Starbucks, and Costco. For $1.50 you can get a soda and hotdog, or $1.99 for a slice of pizza at the Costco. 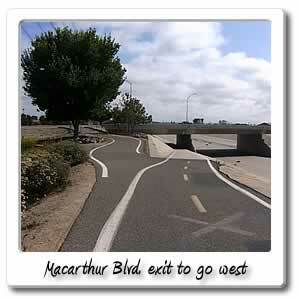 You are in Costa Mesa, and a little more than 1/2 mile east will take you into Santa Ana. 1/2 mile east at Harbor Blvd. you'll find only a Carl's Jr. in that area. If you go about two miles east off of the river trail, that will take you to Bristol Street and if you go south for a mile, that will take you to South Coast Plaza. There you will find major department stores, such as Nordstrom, Sears, Macy's Sak's Fifth Avenue and more. You will also find 250 other retailers, in this upscale and luxurious 3story shopping center, that has the highest sales in the U.S. and is the largest mall in California. There are 4 different Performing Arts Venues around the same area. 1/2 mile up the River Trail will take you to the Segerstrom exit.